Day 6 has arrived, sneaking up on Day 5, shrouded in the black of night before revealing its glory and bludgeoning Day 5 in a gristly dawn spectacle. Welcome to Morgan & Wong Week Weekend! 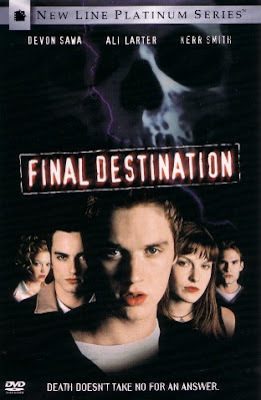 Today we move away from Millennium one more time to look at another slice of Morgan & Wong legacy: Final Destination. This rather quirky horror carried a rather quirky premise: what if you managed to avoid the point when you were meant to die? What if Death was rather miffed by this discourteous lack of time-keeping in regards to copping it, and looked for the nearest opportunity to re-adjust his records. By this I mean - what crafty ways can Death come and kill those pesky people who haven't died? You get the picture. So to commemorate the first - and often argued to be the best - of the Final Destination movies, written and conceived by Morgan and Wong, here's a little video montage to the events of the first film! So what can be said about Final Destination? It was written by Morgan and Wong, with James Wong directing and Glen Morgan working as a film producer. It came out in March 2000 and started Devon "Idle Hands" Sawa, Ali "Resident Evil: Extinction" Larter, Seann "Gross-Out Teen Movie" William Scott and of course, Kristen "Millennium/Space:Above and Beyond" Cloke. Soundtrack was by the great Shirley "Batman: The Animated Series" Walker. It has to be said, I'm not a horror fan. Anyone who has listened to our Horror Special for the Millennium Group Sessions perhaps will remember me bleating on about the fact. However, Final Destination I take exception to - yes, I rather like it. It's silly, nasty and fun - in a horrifyingly inescapable death-stalking way. I always felt Final Destination championed what I see as the quint-essential asset to any good horror film: life is bloody unfair. Yes, Horror works best when its victims are those who don't deserve it in anyway whatsoever. When I first heard of Final Destination I figured it was a group of kids who intentionally look to cheat death via premonition , but it isn't - it's one poor sod who reacts to a dream and others who are forced along with his actions. No one goes out to cheat death really. Alex is perhaps the only one you could point a finger at when he realises, but only in a natural human urge to survive. The rest don't believe him until they see the event for themselves. These aren't stupid kids who have wandered into a haunted house, or decided to dabble with arcane magic they shouldn't, or have released a horror onto the world through some stupid curiosity. These guys are just off to Paris. Their death is pure bad luck - and in tandem, so is their survival. That's a very neat mirror for a horror film. It's a unique concept - one you'd expect from the likes of Morgan and Wong - throwing a little revitalisation to the horror genre. Of course, the state of the franchise now is more questionable - as Millennium fan/horror writer John Kenneth Muir points out in a recent review. The below is an excerpt of that review - a slice which I think is both fascinating and very relevant to the original film. "Watching a death scene unfold in the original Final Destination (2000) is like watching God play Ideal Toy's classic board game, Mouse Trap. With people. I admire this approach because, in some odd way, I believe it actually reflects the shape of life (and death). Case in point, and I've told this story before: In 1989, I was driving to Richmond from New Jersey with my parents. We made a last minute decision to take the family van and not our smaller sedan. About half-way to Richmond, we became positioned on 1-95 behind a car carrying a surfboard on its roof. In short order, the surfboard became unloosed from the top of the car, and -- like a guided missile -- flew backwards into our van's grill. It bounced off and did minimal damage. The Final Destination (in 3-D no less) is perfectly positioned to thrive on that very brand of feeling: on the inevitability of death; on the relief at miraculously evading it; on the thought "There but for the Grace of God go I." This is from John's fantastic blog, Reflections on Film and Television. The FULL article on the latest in the Final Destination franchise - and comments the article received - can be found here. Please support his work! Do you want to own the first three movies on DVD? Final Destination 1, 2 AND 3 on REGION1 DVD? Films that's cast and crew include Millennium wonders such as Morgan and Wong, Kristen Cloke and of course Keegan Connor Tracey? You know the drill! Name and address on an email labelled "Final Destination" and sent to info@backtofrankblack.com - we'll pick the winner later tomorrow! Tomorrow will be the final day of Morgan and Wong Week, and to finish off the seven days we have a feature length podcast with Glen Morgan himself. This is quite an event as Glen's not spoken about Millennium in many, many years. So this is one to look forward to! 5 Responses to "MORGAN AND WONG WEEK: DAY 6 - FINAL DESTINATION"
I loved this movie when it was first released - in fact I think it was my very first DVD purchase! It's a franchise that I would agree has suffered from the law of diminishing and somewhat repetitive returns, but this original still has much to commend it. It was, of course, originally conceived as an X-File, and there's certainly something of its tone and content that still feels like it's connected in some way to the Ten Thirteen universe. Adam, a connection to Millennium, intentional or not. I remember Kristen Cloke's character getting a call or something on her answering machine to call Lara...Lara Means perhaps. And the composer, Shirley Walker also did the score for Space: Above and Beyond. I guess James didn't want to repeat himself. And isn't Ali Larter much more known for her work on the NBC TV series Heroes? Anyway, thanks for a lovely week and I look forward coming home from work tomorrow night with a hot pizza and a great podcast waiting for me. I loved Final Destination, any film that features Kristin Cloke and Ali Larter together is worth repeat viewings, although I preferred Ali in Varsity Blues which is so worth checking out if just to see Ali in a whipped cream bikini. I'm hoping if a Millennium TV movie gets greenlit that Lara Means will return in a dream sequence Frank has in which she's wearing the Whipped Cream Bikini Ali wore in Varsity blues. well said! you've managed to humorously articulate what it is about the first FD movie that makes it so intriguing--- why I liked it, besides another great performance by Kristen Cloke (I'm not a big fan of horror films either. I AM a fan of Cloke). i don't really care for the sequels. nice touch, including comments from John Kenneth Muir. also, it should be said that I love what you've done with M&W week; each day featuring an aspect in the M&W lexicon.